The Trevor Project, a national organization focused on preventing and providing crisis intervention for LGBTQ youth, has launched a new campaign to help save lives - backed by AT&T, both financially and technologically. AT&T has contributed $1 million to the "How to Save a Life" initiative, which aims to turn supporters into volunteer crisis counselors. The telecoms giant is also donating tech-focused services to enhance The Trevor’s Project’s text and chat crisis services, and AT&T employees are being trained as counselors themselves. Last year, AT&T staffers spent more than 1.78 million hours on volunteer work. The campaign’s 30-second PSA features artist and activist Jussie Smollet, who describe the importance of empathy, love, acceptance and hope. 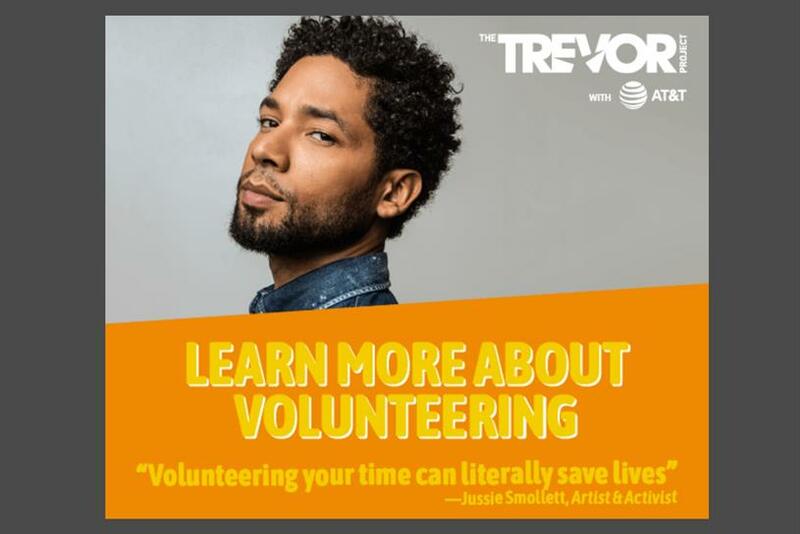 He also describes how supporters can become volunteer crisis counselors for TrevorText and TrevorChat, the organization’s free and confidential support services for young LGBTQ people. Candidates can apply to become a volunteer at TheTrevorProject.org/SaveALife. They will all go through training courses that meet American Association of Suicidology accreditation guidelines. "It’s heartbreaking to think of the amount of LGBTQ youth out there who feel hopeless and alone, or think they don’t have support," said Smollett in a statement. "Just one supportive person can decrease an LGBTQ youth’s risk of suicide by 30 percent, and The Trevor Project is giving everyone the amazing opportunity to be that person. I can’t encourage you enough to apply -- volunteering your time can literally save lives." According to The Trevor Project, LGBTQ youth are more than four times more likely to attempt suicide than their straight peers and nearly 50 percent of all transgender adults have attempted suicide. The organization receives more than 68,000 calls, chats and texts each year, but it estimates that more than 1.5 million LGBTQ youth think about suicide and could benefit from counseling services.